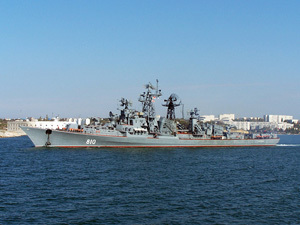 Smetlivy is a Project 01090 destroyer. The ship was laid down on July 15, 1966 at 61 Communards Shipyard (Nikolayev) as a Project 61M large ASW ship; launched on August 26, 1967; commissioned on October 21, 1969. In 1970's the ship visited Syria, Yugoslavia, Bulgaria; in 1980 – Tunisia. In 1990-1995 the ship was remanufactured under Project 01090. In 2003 the ship within the Black Sea Fleet task force participated in ocean exercise along with Pacific Fleet and Indian Navy. In 2011, the ship accompanied by rescue ship Epron was on cruise to the Mediterranean Sea since Oct 30 till Nov 21. During the deployment, BSF mariners visited Italian ports of Augusta and Taranto, and participated in the IONIEX 2011 Russian-Italian naval exercise held in the Ionian Sea. Since March 31 through May 31, 2012 the ship was on patrol in different parts of the Mediterranean Sea, particularly near Syria, having covered over 11,000 nautical miles.